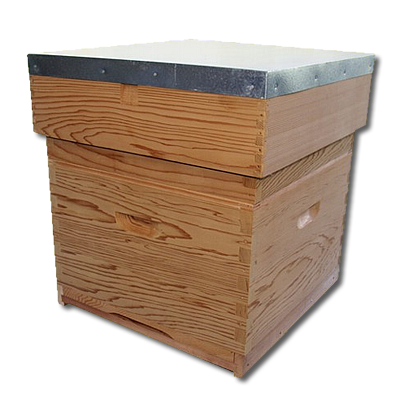 The picture shown is of the complete hive Made-up. Made from the finest seasoned Western Red Cedar and Softwood. Standard Floor with Entrance Block, Brood Chamber complete with 12 Hoffman Self Spacing Frames and Wired Foundation, Framed wire queen excluder, one Super complete with 12 Hoffman Self Spacing Frames and Wired Foundation, Crownboard with 2 Porter Bee Escapes and a Galvanised Metal Covered 4" Roof. Full assembly instructions, Pins, Nails and Glue included.